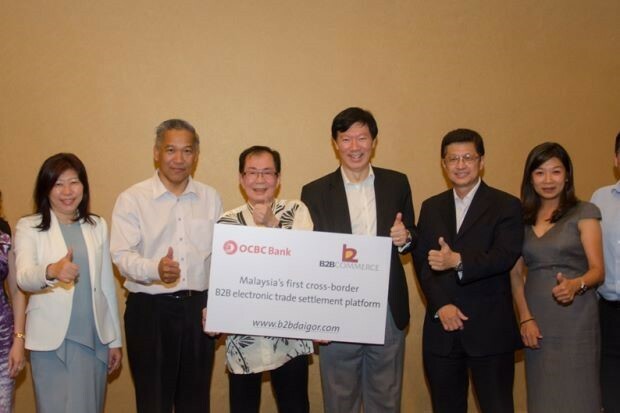 KUALA LUMPUR: B2B Commerce (M) Sdn Bhd, which partnered OCBC Bank (M) Bhd, has become Malaysia’s first home-grown company to facilitate cross-border business-to-business (B2B) electronic trade settlements for SMEs. In a statement, OCBC said the move, featuring B2B Commerce’s new online platform B2B DaiGor, was expected to help SMEs contain cost whilst minimising the hassles related to cross-border transactions. It will benefit existing SMEs in the import-export market and those who are ready to take on the global market. While B2B DaiGor enables SMEs to expand their market reach globally and manage their transactions digitally, OCBC Bank facilitates the settlement dimensions so the global financial transactions run smoothly and seamlessly. B2B Commerce Director and CEO Dr Lee Thean Seong said the company’s studies have shown that without the financial muscle it is hard for smaller brands to compete on a level playing field against branded products in existing B2B e-marketplaces. “We are thankful for the partnership with OCBC Bank which will ensure the financial transactions are carried out smoothly and seamlessly,” he said. Its existing services include efficient electronic trade documents exchange, data analytics to help customers achieve supply chain efficiency, peer-to-peer financing services through its subsidiary B2B FinPal Sdn Bhd as well as domestic logistics distribution services through Asia Commerce Logistics Sdn Bhd (ACL), its joint venture company with Hercules Logistics ShenZhen, China. OCBC Bank head of global transaction banking Chong Lee Ying said being the exclusive transaction enabler for the home-grown first-of-its-kind online platform was a privilege and, as a long-standing supporter of SMEs, the bank is looking forward to helping them tap into the opportunities out there and meet their ongoing digital banking needs. “We have in recent times explored several digital initiatives including rolling out the country’s first mobile business banking app. Today’s strategic partnership with B2B Commerce is a significant one for helping SMEs meet their needs at a global level. “This will help boost the SME segment and assist local SMEs in their bid to reach out more significantly through the online export business,” she said.